The flag-ship of the fleet, CTJ has been making pilots for as long as any of us remember. We frequently hear stories decades-old of first-solos on our aircraft. With fresh paint in 2018 we’re excited for the decades to come! 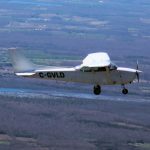 Purchased in 2014, FWQ has been a great platform for both IFR and VFR training and leisure. 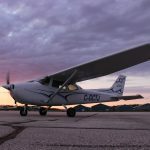 Featuring a Garmin 530 GPS/NavCom, new Garmin G5 HSI/backup attitude indicator, and digital transponder, FWQ lets us go more in-depth with modern equipment. Our newest (to us) 172, VLD has been online since summer 2017. With a digital transponder, and new ICom radio in 2019, it’s a solid platform. At over 20,000 hours on the airframe, many first flights, solos, and licences have happened on VLD, will yours be next? We’re excited to get back into multi-engine training! 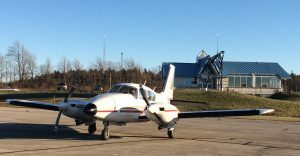 The Piper Aztec is a powerful platform sporting the same Garmin 530 FWQ has. Add retractable gear, autopilot, radar, and 900 nautical mile range, and it’s the perfect platform for your Multi or Multi-IFR training. Charters soon! Our Flight Simulator is an awesome addition to our training fleet. Based on the foundation of Precision Flight Controls hardware, we have made significant upgrades and modifications to create a truly immersive experience for single or multi-engine. 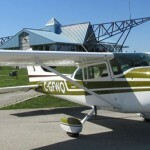 Our Simulator is a Level 2 Flight Training Device certified by Transport Canada. Students working towards a Private Pilot Licence can log 3 of the 5 hours of required instrument time on our Sim. For Night Ratings, 5 of the 10 hours can be done in the sim. Aspiring Commercial Pilots can do 10 of the 20 required hours in the Sim, and pilots working towards an Instrument Rating can do 20 of the required 40 hours of instrument time in the Sim. 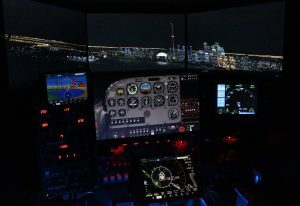 Featuring a Garmin 530 replica, the Flight simulator is a valuable tool for perfecting instrument procedures, and is an affordable alternative to doing the flying in the aircraft. The simulator rents out Dual for $125/hr compared to $225/hr for an hour of Dual in the aircraft! Aspiring Instrument Rating pilots can benefit greatly by spending many hours in the Sim practicing Holds and Approaches at reduced cost!